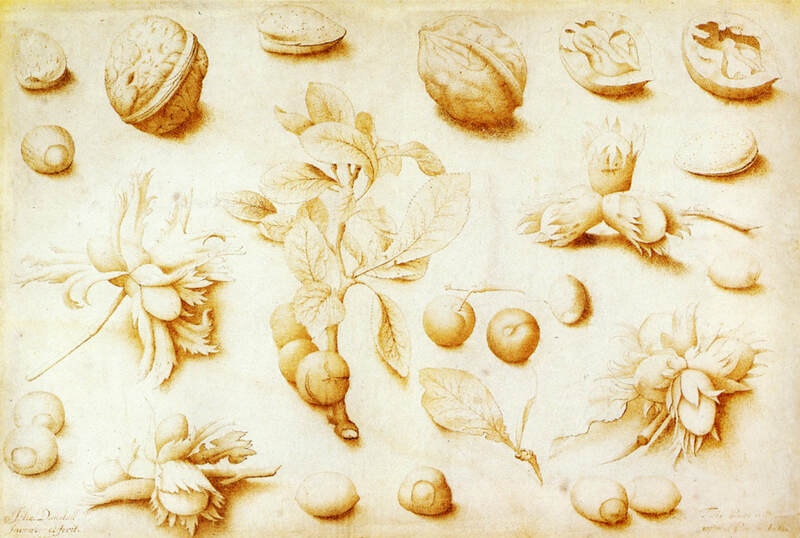 The banner is part of a drawing of Studies of Walnuts and Hazelnuts done by John Dunstall in 1666. ​The drawing is executed in Pen and brown ink over metalpoint outlines on vellum. Why is pen and ink used for botanical illustration? and finally - it's much cheaper for the publisher to print monochrome illustrations than it is to print full colour ones! 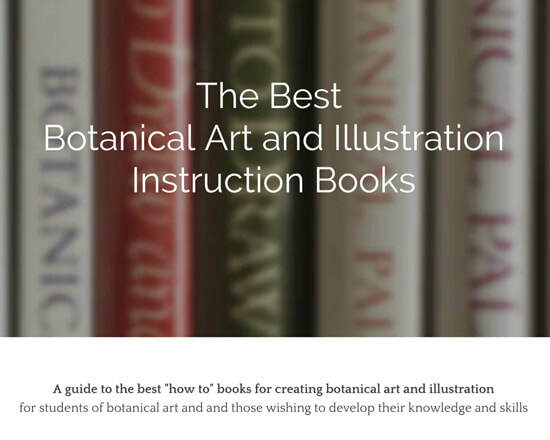 CLICK BUTTON (above) to see the page (in the Botany section) which has much more detail on approaches to scientific botanical illustration - the bulk of which is done in liaison with botanical gardens and botanists. Biological Illustration: A Guide to Drawing for Reproduction by Claire Dalby and D. H. Dalby. This provides a detailed discussion of drawing in pen and ink and in particular the nature of line and tone that can be achieved using pen and ink. Scientific Illustration: Pen and Ink Techniques - Line & Stippling - April 20th - Lizzie Harper Before being able to work into tone in pen and ink, you need to be confident of your lines. Pen and Ink | Association of Medical Illustrators - Tim Phelps explains why he uses pen and ink for scientific illustrations. He details pens and supports he uses today. Botanical Illustrator Alice Tangerini - discusses some of her approaches to producing botanical illustrations for the Smithsonian. The techniques used for drawing with pen and ink for reproduction in part depends on the technological process that will be used for printing. line - used in a very precise way. Being able to draw an unwavering line in a relaxed way requires lots and lots of practice. Aim for a slow and continuous flowing movement. It's best to draw from top to bottom and towards you rather than away from you. hatching - to create tone - is achieved by drawing lots of lines. This needs to be done carefully to be really effective. These can be parallel lines drawn generally parallel to the main axis of the drawing. Draw the left hand line first if you are right handed and the right hand one first if you are left-handed. stipple (lots of dots) are an effective way of rendering tone but it takes some practice to look effective - as opposed to a mess. Dors are often preferred by botanists as it avoids any potential confusion between a line which is describing form and one which describes shade. dots and dashes - takes the emphasis off a line which is present but not "shouting"
In a pen and ink drawing, hatching or stippling should be used to show tone and form - and are NOT ways to a fill a space. One of the most difficult things when doing a pen and ink drawing is understanding when to stop using your pen! A great example of sustained and consistent pen and ink drawing is Stella Ross Craig's Drawings of British Plants. She used a mixture of line and stipple to describe a plant. Ink drawings are often reduced for publication, however this can mean that finer detail becomes lost. ​Consequently you need to know whether or not a drawing is for reproduction before you start and to what extent the image might be resized. (This also has implications for how you represent scale). A very consistent hard surface - without give - is preferable. One that does not allow the ink to bleed or absorb into the fibres within the paper. Lines need to be clean and not furry! Surfaces with a tooth will create a drag on the pen nib. Most prefer to draw on a smooth surface which allows the pen nib or point to move smoothly. Favoured surfaces include Illustration board, Bristol Board (paper) and drafting film (vellum). Heavier weight Bristol Board (eg 4 sheet or 5 sheet) is preferable for larger drawings as the heavier weight paper helps to prevent creasing. Cartridge paper is more suited to pencil drawings as it lacks the smoothness of paper designed for pen and ink. Consideration also needs to be given to the extent to which the support will allow erasure (although now most drawings are converted to digital images for reproduction this is of less consequence). 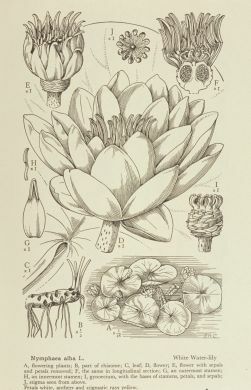 What type of pen is used for botanical illustration? Those who favour pen and ink tend to be devoted to either dip pen or technical drawing pens. The latter give a totally consistent line but can be a bit more boring when compared to the lines that can be achieved with the benefit of a pointed and flexible nib. Most professional botanical illustrators using pen and ink will will use a technical drawing pen - such as a Rapidograph or Isograph. This has a tubular nib and the line they produce comes in a range of predetermined widths which conform to ISO standards. Essentially they produce a very consistent and stable line with little variation in width. The pens also use typically use permanent black ink. Botanical artists will sometimes vary the dilution of the ink to get gradations of tone without needing to change the line width. This is a stop-motion video of a botanist (Alastair Robinson) drawing a new orchid species using a Rotring Rapidograph. A Rapidograph comes in 13 line widths and this set has three of them (0.25 mm, 0.35 mm and 0.50 mm). The hard chrome-plated thin tip is very resistant to wear as these type of pens are used continuously within the context of professional/commercial use. The pens use cartridges of ink specifically designed for these pens. Esmée Winkel GM is a professional scientific illustrator who draws in pen and ink. After the RHS Botanical Art Show in 2016, where we discussed use of pen and ink she very kindly sent me some notes about how she uses a Røtring Pen for sharing with botanical art students. Many botanical illustrators use a technical pen - such as a Rapidograph for their monochrome botanical illustration in pen and ink. However technical pens can get clogged and fail to perform well - and that might be because they need to be cleaned. There's a Rapidograph cleaning kit and this is how to use it. The disadvantage of a disposable permanent ink pen is that, unlike technical drawing pens, you have to go with the colour of ink chosen by the manufacturer and you cannot vary the saturation level in any way. There are various brands of disposable permanent ink pens. Some of the ones I would recommend and I know are used by professional illustrators are show below. ​The Pigment Liner uses indelible pigment ink which is discharged though a metal nib (which means that this does not deteriorate before the ink runs out). There are a range of widths from 0.05mm fine line up to a 2mm chisel tip. The best ones for botanical illustration are the fine lines less than 0.5mm. Below is a set of 0.05 mm pigment liners by Staedtler - which deliver an incredibly fine line - and which I buy on a periodic basis. ​You can leave the cap off for a long time without the pen drying out - you just need to remember not to skip a day and leave the top off for more than 18 hours while they are not in use! The Pigma ink is permanent, acid-free and waterproof and you can get it in black or sepia. Obviously black is desirable for reproduction- but it's nice to have sepia for original art for sale. The nib produces a fine line. The width sizes are all numbered and the numbers do not correspond to mm widths - which is slightly confusing! Botanical artists who use pens but don't adopt the precise approach of the professional botanical illustrator (eg Francesca Anderson) will often use a dip pen. The main advantage of using a dip pen is that it allows the artist to vary the weight of the line - which is impossible if you use a technical drawing pen which is manufactured to deliver a consistent line of a precise width. Dip pens can also be used with coloured inks. Some would say that dips pens are for purists and fine artists (eg botanical art) and technical pens are for those involved in technical or scientific drawing (eg botanical illustration). However it's not actually as simple as that. It really depends on how skilled you are using them and the techniques you use . ​The first video explains about the dip pen and why artists like to use them. ​The second video explains how to draw a botanical subject using a dip pen. Pigment liners are also used as the ink used in them can be both waterproof and lightfast - and there's no need to mess about with bottles of ink or changing ink cartridges. They also come in a variety of weight of lines.